Have you ever wondered what makes classical music so beautiful and poignant? Did you ever get the feeling that you didn’t understand music enough to fully enjoy a concert? The Art of Listening is perfect for you! The Art of Listening is an interactive tour through the essential works, concepts, and characters of classical music. Mingling live performance and collaborative inquiry, each session of this unique conversation-concert takes the audience on a deep dive into the rich inner world of a chosen masterwork. After a “cold opening” performance of the work by award-winning pianist Javor Bracic (and guests), audience members are invited to jump in with in-the-moment thoughts and impressions. Building on the audience’s insights, Bracic skillfully facilitates a discovery of the work’s emotional narrative and its underlying theoretical concepts, illuminating the poetry, nuance, and daring innovation that give the composition its power. A discussion of historical, cultural, and biographical context offers further dimension, and poses questions about how and why the piece might still be relevant to our lives today. After the discussion, the piece is performed a final time in order to allow the audience to listen and experience it in an entirely new way. Mr. Bračić, has created a series and a format that aim to “change the way you think about classical music.” Based on my experience this past Sunday, I’d say he’s well on his way as a persuasive music educator, and he is a very capable pianist. [...] his engaging, soft-spoken manner, and his ability to involve the audience created an ease that drew everyone right in, regardless of their prior music education or experience. Everyone’s input was valued, there was never any condescension or feeling of “this way is right and that way is wrong.” [...] Not everyone has this double ability to speak well about music while remaining a super executant, but Mr. Bračić, definitely has it. 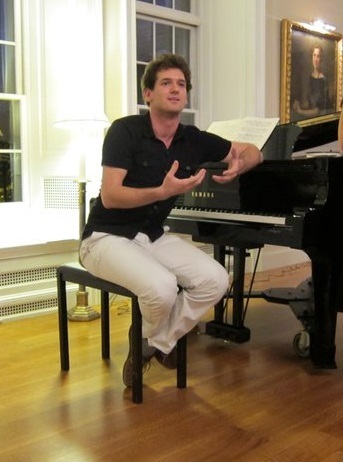 "Javor Bracic has been teaching the Art of Listening to Music, our music appreciation class at the 92nd Street Y’s Himan Brown Senior Program since 2016. His incredible talent as a musician coupled with his charismatic teaching style, has made him a favorite among our faculty. Several times a year, we are also very fortunate to have Javor perform a piano recital for our members. His performances easily draw 100 of our members who flock to hear him. I would strongly recommend Javor for any class or performance – he will exceed any expectations!" "It was a privilege to listen to Javor's extraordinary performance while we embarked upon a journey set against the background of Chopin's 19th century Europe. Inviting us to explore the two pieces, his insights – whether technical, musical or historical – offered valuable context and focus while he took us through a playful iterative process, demystifying the music and making it accessible for all." "How frequent is it that you go to a concert, love the beauty of the music but can only wish you could appreciate it in the same level a musician does, from the heights of their decade-long education in music theory and daily practicing? Javor's initiative bridges this very gap, by combining his superb piano abilities with a lecture on the piece just played. I left with not only a very pleasant evening to remember but also with a more profound admiration of Chopin's music. Bringing it back to my sciency world, I can only imagine this sudden feeling of horizon-broadening and enlightenment is similar to what a non-scientist gets after a good public lecture. The importance of outreach can never be understated. Art and pure science may be what philosophers call "high pleasure", but they are not to be an elitist privilege. Thanks Javor for this inspiring initiative and keep sharing your passion with us -- it's contagious!" "I just came back from vacation, overwhelmed with emails and to-do's. When you started to speak I paused to listen for a minute and I stayed rooted to the spot. Listening to you was one of the most profound experiences I have had lately. Boy I did not expect this. I loved the things you talked about, fear, procrastination, learning... but most of all I loved how you captured everybody. I could feel people's attention, I could almost touch the silence and focus you created, and I could not move. I like how you used pauses, as I love silence and quiet. And there is a way to break it. I don't want to go on and on, so a big, huge THANK YOU. Listening to you was a privilege." What is the Art of Listening? The Art of Listening is an interactive concert with the goal of bringing classical music closer to the audience. It is a new kind of performance: equal parts concert, presentation, and conversation. No. It is much more. It’s an experience in itself. The Art of Listening combines high quality live performance and an open discussion about what makes classical music beautiful and why we still listen to it today. Why do we still listen to classical music? In today’s fast-paced world, we are used to quickly act and react. We are rarely invited to take a step back to listen and reflect. Masterworks of classical music are imaginative spaces abundant with meaningful metaphors. They offer us an opportunity to engage our inner world and become more mindful of who we are. By listening to music, we in fact listen to ourselves. Did you invent this, or are there others who do this too? My greatest inspiration comes from the Young People’s Concerts by Leonard Bernstein. I take it a step further and make it interactive. I am not aware of any musicians currently offering this kind of in-depth joint exploration of classical music. Is it like a lecture-recital with a Q&A? My concept is different from a standard lecture-recital in the fact that I do not deliver a memorized text, but encourage audience members to find their own individual path to discovery through personal reflection about the music. Questions are incorporated into the presentation – not just an optional section at the end. Often I will be the one asking questions. Why change the way classical music is done today? I feel classical music often gets mystified as something elitist and hard to understand. And yes, it is great and exalted, but it should not be exclusive, on the contrary! This music was written by humans, for humans, therefore everyone is invited to participate in it. But many people do go to regular concerts. Why do we need the Art of Listening? I often hear concert goes report that they loved the concert, but wished they knew more about music. There seems to be this sense of inadequacy in us which is entirely unnecessary. In order to enjoy classical music better, we don't need to have more knowledge about it. All we need is a guided listening experience on a deeper level. The Art of Listening is an answer to this problem. It’s a way to gain access to the world of classical music directly, as a listener, without having to spend years practicing an instrument. Are you trying to popularize classical music? Yes and no. I am aware that classical music will never be popular, because art music requires a different kind of listening than entertainment. Still, I would like more people to become aware of the wonders of classical music and become better listeners in general. This should not be done by "popularizing" music and cheapening it, but by exposing a new way of listening to it. It's exactly through the struggle to understand it and listen ever more closely to its nuances and complexities that we become part of something greater than ourselves - we allow the music to elevate our spirit from the everyday. What is the usual course of your presentation? The presentation opens with a short musical performance. Audience members are then encouraged to reflect and share their impressions and interpretations. A lively discussion ensues, in which many basic musical concepts are explained, backed by immediate examples at the piano. The conversation often ventures into the realms of philosophy, physics, psychology, and history. In the end, the same piece of music is played once again, but with the acquired knowledge and experience, the audience perceives it more clearly and interprets it differently – with a deeper understanding and a sense of intimate connection. Is there any theory behind the Art of Listening? The theory behind this concept stems from the writings of the music theorist Edward T. Cone. Cone posited that musical masterworks need to be heard (at least) three times in order to be better understood. The first listening is necessarily inadequate, since we are not yet aware of the piece in its entirety. We can only intuitively grasp certain aspects of the piece on the fly. Only after we heard the piece once through can we make any statements or conclusions about it. This is the second listening – an analytic listening in which we strive to make observations, connections, and interpretations of the music. This is a more verbal, left-brain activity, perfectly suited for a discussion in which bits and pieces of the music are regarded separately. However, this is not the final stage of understanding music, according to Cone. After the analytical listening, the crucial step is bringing these newly acquired concepts back into an uninterrupted third listening. This is where we integrate our rational conclusions into the sensory experience of listening to the music. What is the ideal venue for the Art of Listening? Classical music for piano was created mostly for intimate salon settings. This is where the Art of Listening belongs and feels at home. It can also work in small auditoriums and community halls, even schools and hospitals, but it is not very well suited for large concert halls or performance spaces with a tall stage because they do not foster the two-way communication between musician and audience, which is central to the concept. Can we host the Art of Listening at our home? Yes. That would be the ideal setting. As long as you have a piano, you are all set. Is the Art of Listening suited for a corporate environment? Yes. It works great as an artistic team-building event for your company because it invites the personalities of the audience members to shine and it engages them in creative, imaginative thinking. I also give inspirational talks on my creative practice and strategies of coping with challenges and fears that classical musicians face on a daily basis. This may serve as a good starting point for a deeper discussion about how to restructure the work environment in your company. How elegant is the event? Do you prefer a cocktail party or a casual gathering? This depends mostly on what you feel like. My goal is to change the way classical music is perceived and what it is appreciated for – not for the glamour and elitism, but for the fascinating, life-changing emotional and intellectual content. That been said, it’s always nice to have an excuse to dress up! How many instances of the Art of Listening have you done so far? Over fifty. The Art of Listening has been presented in series at the 92nd Street Y, ivy.com, the International House New York, the Roger Smith hotel, Prezi Headquarters in Budapest, Hungary, and various schools such as Queens College, Hunter College, NYU Media and Games Network, the CUNY Graduate Center, and the Rushmore Music Festival, SD. How many people is the ideal audience? The key is a small audience and an intimate setting where everyone feels invited to participate with their thoughts, visions, and questions, no matter how silly or bold they are. In the past, I have done performances for audiences ranging from only one up to about a hundred, but it works best with 10-30 people. It is quite versatile. Usually, the concepts discussed range from creativity, innovation, and aesthetics to loss, grief, and acceptance, but I have done variants of the Art of Listening for 3-5 year olds too – demonstrating mostly how music expresses basic emotions of happiness, sadness, anger, and fear. We are absolute beginners and have never taken music classes. Will we be intimidated? It is geared exactly towards you. I never just throw musical terms at you, expecting you’ll get it. This is the advantage of the small-scale conversational concept. By conversing first, I find out exactly how much my audience understands, and tailor the presentation specifically for them. I also take time to repeat and demonstrate as long as necessary for my audience to have the “aha” moment. Is it for beginners only? Will experienced listeners be bored? It can be adapted to audiences who have listened to classical music all their lives, or to young people who are just discovering it. In one instance, a gentleman who was hosting the Art of Listening exclaimed that even though he had listened to classical music all his life, his eyes (and ears) were opened to a completely new way of listening. He said this was the first time he truly heard what the music was saying. It is quite versatile in this respect as well. It can range from 30-40 minutes up to 90-100 minutes, depending on the program, and how open and interested the audience is. Which pieces of music do you usually present? Which program do you suggest as the first, introductory one? Chopin always works as an introduction, so if you have no strong preference, I would highly recommend starting with the Nocturne, Op.27, No.1 or the Scherzo No.2. Other popular programs are Beethoven, Schubert, and Debussy. Is there a shortened version of your presentation? No, because that would defeat the purpose of my concept. The full experience of classical music can only be achieved by being present and participating in the entire process of discovery. Is there a video that we can see ahead?